The Bua is a tributary of the Gaula that runs from high in the mountains to where it enters the Gaula near Rognes. The Bua is a narrow, steep and powerful river. Many fishermen wonder how salmon can possibly make it up such a river, and it is perhaps because of this that the Bua salmon are steeped in local legend as being particularly strong, bright and hard fighting fish. The Bua is actually the highest altitude salmon-bearing river in all of Europe. The Bua Bridge Pool is one of the best holding pools on the entire Bua river. The pool is located under the bua bridge, which is approximately 3.5 km. up the Bua River Road from the main road (Rt. 30). The pool is well defined, beginning just above the pool, and tailing out near the rapids below. To fish it most effectively, one should approach it cautiously from above the bridge. Even peering over the bridge to try to spot fish below can put the fish down and ruin one’s chances for a take. Above the bridge, there is a marked path with a rope-handle to assist in the descent to the pool. Once down, above the bridge and the pool, one can start fishing the pool by making short casts to cover the soft water behind the rocks that make up the head of the pool. Slowly begin to lengthen line, so as to cover the entire pool’s width. Eventually, one can begin to take steps down towards the bridge, covering the head of the pool, and eventually, when you find yourself under the bridge, you can cover the belly of the pool. Caution! The height under the bridge makes casting a challenge, and be careful not to break your rod tip on the underside of the bridge while casting! In this small pool, a more compact double-handed rod, or a single-handed rod with a shooting head will work best (12.5-13.5ft. double-handed rod, or a 9ft single handed). The fish tend to hold anywhere from the upper edge of the bridge, to directly below the bridge, and may even hold all the way down to the tail of the pool before the rapids. This pool fishes best once the river has dropped quite a bit, and usually once the Gaulfoss gauge is below 180m³. This pool is quite small, and while it can hold many fish, they are easily spooked. Approach this pool with the caution one would approach a brown trout river, the stealthier the approach, the better the chance of getting a take. Because of the steep gradient and narrow banks of the Bua, this river does not fish so well in extremely high-water levels. 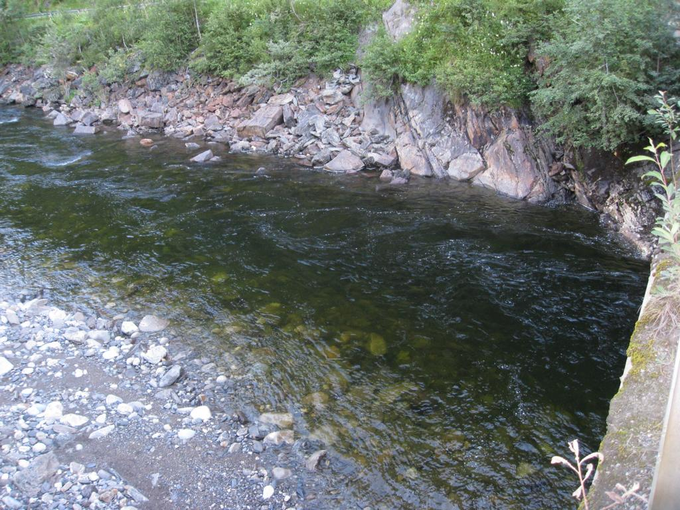 Once the Gaulfossen gauge has dropped to around 180m³ and below, the Bua becomes interesting. At this water level, the head of the pool, below the bridge, may be too fast to fish, so focus efforts on the belly and towards the tail of the pool. 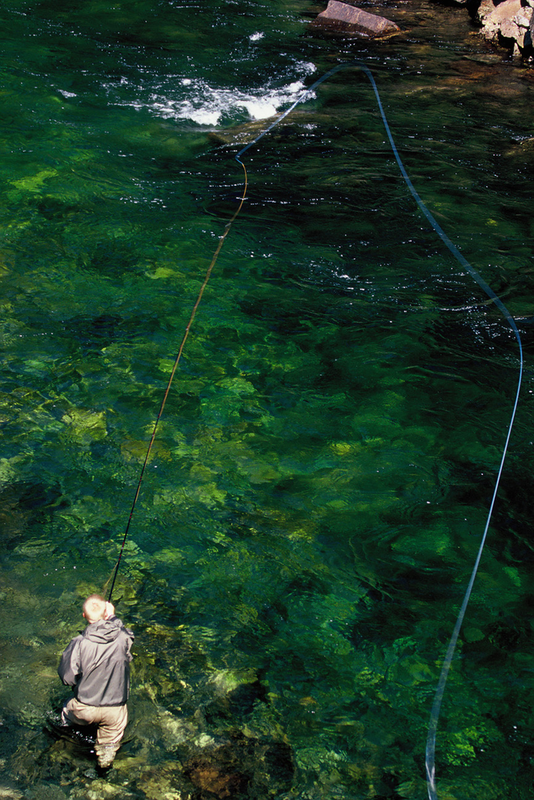 This pool is quite deep, so fishing with a heavy sink tip, or heavily weighted fly is recommended. In medium levels, the pool really begins to fish well. As explained above, begin to fish the pool from above the bridge. Follow the footpath with the rope handle down to the river’s edge above the bridge. From there start with short casts to cover the pockets behind the large stones. Gradually, increase the length of each cast to cover the channel on the far side of the pool (still above the bridge). Eventually one can start to carefully follow the stone riverbank below the bridge, fishing through the belly of the pool. Try to keep a low profile, splashing as little as possible to avoid spooking the fish. This pool is quite short, and to fish it effectively one must wade in a position where fish will notice- so after having fished through once, let the pool rest a while before taking another pass with a different line and fly combination. In low water, this pool can become quite spooky, as the water is quite clear, and the fish are mostly residents by this point. This is a great opportunity to try out various techniques, such as throwing a dry fly (bomber or such) or trying a riffling hitch or a micro tube fly. Lengthen leaders to avoid spooking fish, and try to cover as much of the pool as possible from above the bridge- again to avoid spooking the fish. In this water level, the head of the pool (above the bridge) can hold fish as they tend to congregate in the most highly oxygenated waters. Once a fish has taken, one has to try to keep the fish in the pool. 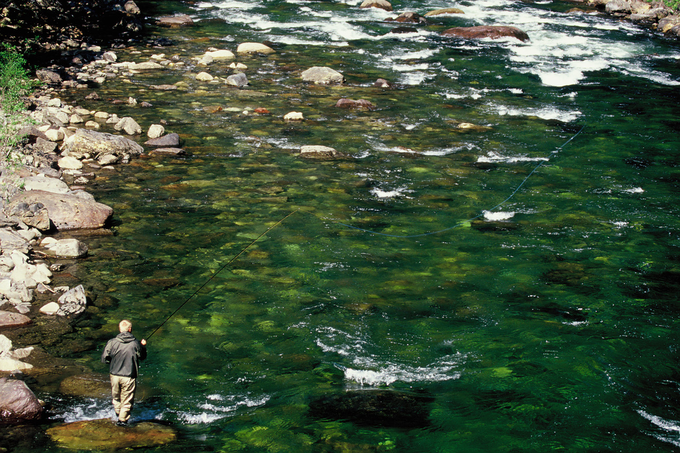 If a fish is able to make its way downstream of the pool- into the rapids below- the fight is almost always lost. But by maintaining a steady, yet gentle pressure, one can often get below the fish and let the fish fight the current as well as the line and tire itself out. This is by far one of the most exciting pools to land a fish in and definitely worth the time and effort to fish it!